While the 2015 pilot was limited to one hospital unit, Mission says it will place the Cerner tech in every room of its planned new hospital. While one might think patient falls are inevitable in a hospital, health system Mission Health says it may may be able to eliminate the issue through the use of virtual 3-D observation technology. In fact, it’s so bullish on the tech that it plans to include the system in every room of its new 220-bed Hospital for Advanced Medicine by the time it opens in Spring 2019. The system conducted a 90-day pilot in 2015 in its neuroscience unit using the new tech, which is designed to prevent falls. During that period, there were zero unassisted falls with patients monitored by the observation technology compared with 10 unassisted falls with the standard treatment patient group. The technology, Patient Observer from Cerner, uses a core camera technology with a Microsoft Kinect sensor and Microsoft Surface Pro 4 tablet system that provides 3-D skeletal visualization and depth sensing within 20 feet. 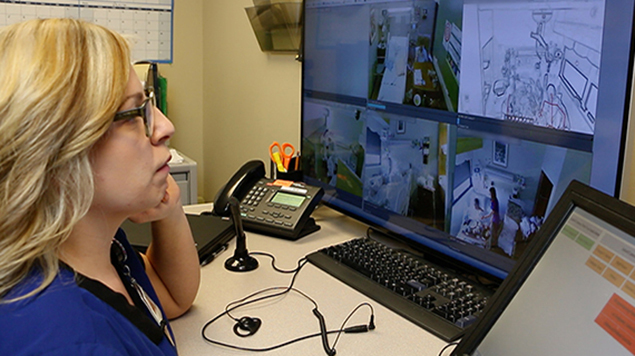 The software allows a monitor technician to define and draw virtual zones, trip wires and other trigger points around a patient within a field of view. The technology includes bi-directional audio, which allows the monitor tech to interact with or listen into a patient room. “Mission has demonstrated real value with Patient Observer deployed for falls-risk patients, yet we believe that Patient Observer is a technology platform, which will deliver value on additional use cases throughout the health system,” Westle said. When it came to the pilot, a team of registered nurses from the neuroscience unit used the Morse Falls Scale criteria along with their clinical expertise to develop an algorithm to identify patients with the highest risk for a fall in the unit. This same team developed a clinical workflow to deploy the Patient Observer technology, based on the patient assessment. The study showed that redirection of the patient was highly effective in reducing the risk of a fall. “These incredible results were achieved through engagement of clinical resources and integration of technology into nurse-driven clinical workflows,” Westle said. Patient Observer is intended to be used as an addition to and not replacement of a multi-component fall prevention program, Westle said. At Mission Health, there is a comprehensive fall prevention program in place and adhered to by care teams. Standard fall-prevention interventions include: bed locked in low position with rails up, call light, call bell, assistive devices, personal items within the patient’s reach, non-slip patient footwear, clutter-free room, appropriate use of sensory aids, dry floor and adequate lighting, hourly clinician rounds, and patient and family education. Mission Health also uses the patient’s individual fall risk to tailor interventions, such as bed and chair alarms, yellow identification armbands or gowns, and alert signage outside the patient’s room.